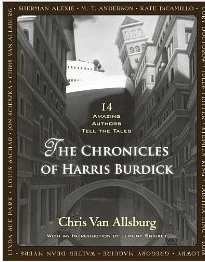 Show of hands...who ever had to write a short story in Creative Writing based off of Chris Van Allsburg's The Mysteries of Harris Burdick? I definitely did when I was in seventh grade, and I thought it was the coolest assignment ever! I wrote my story on "Mr. Linden's Library" and I still have it floating around on my hard drive somewhere. If you haven't heard of this picture book (which is tragic, and you should go get a copy), then what it is a picture book composed entirely of fourteen pictures, titles, and captions. Van Allsburg gives an introduction in which he tells us that they came from a book editor who received them from a man named Harris Burdick. He asked the ediotr to look at some samples of his work, and then promised to return with all fourteen stories and illustrations. He never did. While I never actually wrote any other stories based on that amazing picture book, I sure thought about it, and those pictures and captions really captured my imagination and made me long to figure out the mystery behind Harris Burdick. I thought about him every time I walked by Van Allsburg's books at work (I also recommend Queen of the Falls and The Polar Express!). I was so, so, so tempted to buy it then and there, but I held myself back. (Maybe for Christmas...) Instead, I read the stories while at the store. It is going to be my next pick of the month, for sure (if I can sell the copy of How to Save a Life that's sitting in the slot, it'll go up sooner). I'll have to post a review sometime this month, but let me tell you...this book rocks. I love it, love it, love it. I will forgive Walter Dean Meyers for making his version of "Mr. Linden's Library" so different from mine, and I want to high-five Stephen King for his awesome finishing piece. These stories are so wonderful, they'll make you want to pick up a pen and create your own. 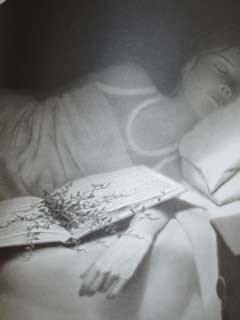 I would totally be open to a Chronicles of Harris Burdick Volume II! Did you ever write a Harris Burdick story? What was yours about? And for you teachers out there...copy and paste no more! There is now a Harris Burdick portfolio version to use for your creative writing classes! This looks soooo amazing! The illustrator, those writers...eek! Have no idea how you restrained yourself to wait!